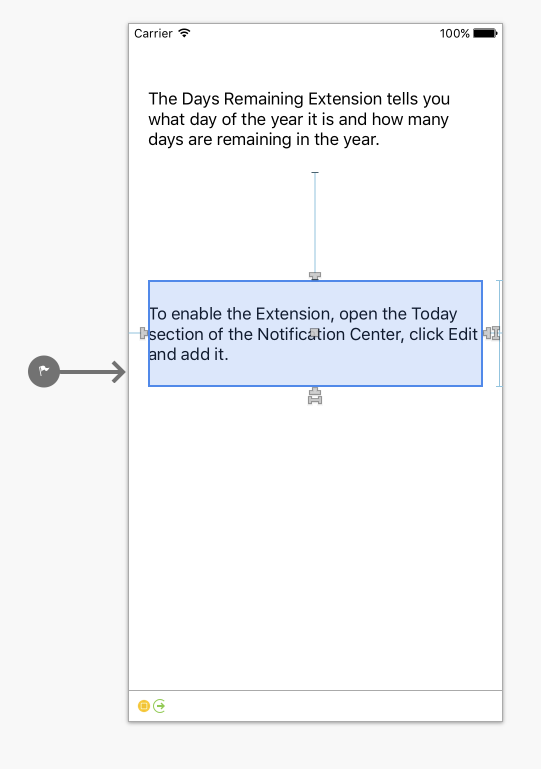 Extensions, as introduced in iOS 8, are specialized UIViewControllers that are presented by iOS inside standard contexts such as within the Notification Center, as custom keyboard types requested by the user to perform specialized input or other contexts like editing a photo where the Extension can provide special effect filters. All Extensions are installed in conjunction with a Container app (with both elements written using the 64-bit Unified APIs) and are activated from a particular Extension Point in a Host app. And since they will be used as supplements to existing system functions, they must be high performance, lean, and robust. Additional extension points were added in iOS 10. Extensions have a number of limitations, some of which are universal to all types (for instance, no type of Extension can access the cameras or microphones) while other types of Extension may have specific limitations on their usage (for instance, custom keyboards cannot be used for secure data entry fields such as for passwords). iOS enforces a 16 MB memory usage limit on Today's extensions. By default keyboard extensions don't have access to the network. 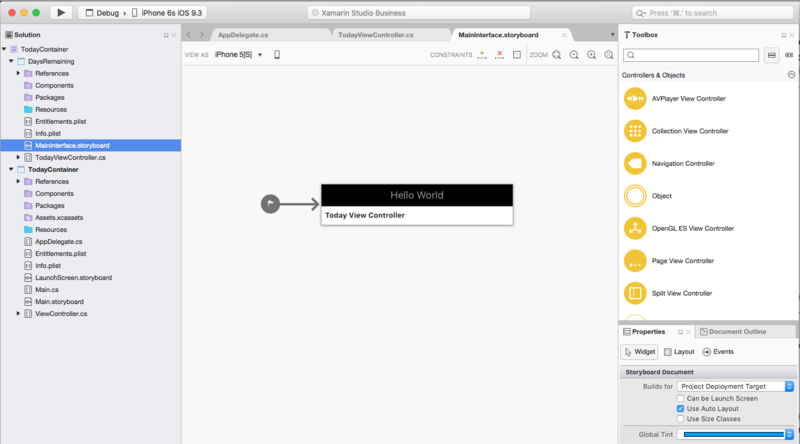 This affects debugging on device (the restriction is not enforced in the simulator), since Xamarin.iOS requires network access for debugging to work. It's possible to request network access by setting the Requests Open Access value in the project's Info.plist to Yes. Please see Apple's Custom Keyboard Guide for more information about keyboard extension limitations. For individual limitations, please see Apple's App Extension Programming Guide. 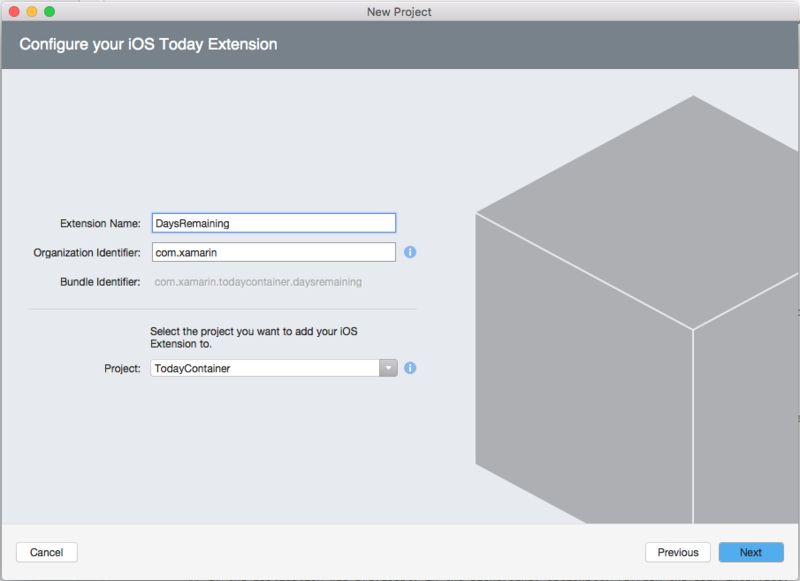 Extensions are distributed from within a container app, which, in turn is submitted and distributed via the App Store. 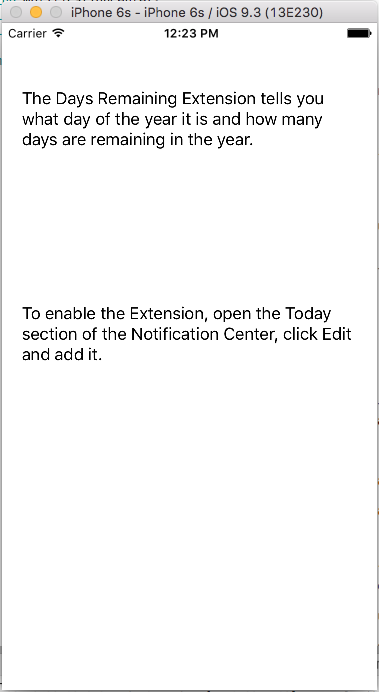 The Extension(s) distributed with the app are installed at that point, but the user must enable each Extension explicitly. The different types of Extensions are enabled in different ways; several require the user to navigate to the Settings app and enable them from there. While others are enabled at point of use, such as enabling a Sharing Extension when sending a photo. The app in which the Extension is used (where the user encounters the Extension Point) is referred to as the Host app, since it is the app that hosts the Extension when it executes. The app that installs the Extension is the Container app, because it is the app that contained the Extension when it was installed. 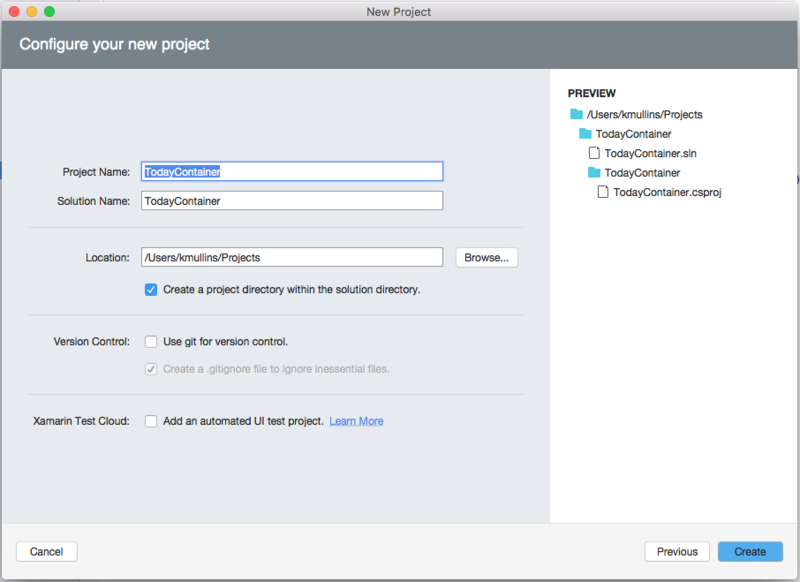 Typically, the container app describes the extension and walks the user through the process of enabling it. An Extension can be as simple as a single UIViewController or more complex Extensions that present multiple screens of UI. When the user encounters an Extension Points (such as when sharing an image), they will have an opportunity to choose from the Extensions registered for that Extension Point. If they choose one of your app's Extensions, its UIViewController will be instantiated and begin the normal View Controller lifecycle. However, unlike a normal app, which are suspended but not generally terminated when the user finishes interacting with them, Extensions are loaded, executed, and then terminated repeatedly. Extensions can communicate with their Host apps via an NSExtensionContext object. Some Extensions have operations that receive asynchronous callbacks with the results. These callbacks will be executed on background threads and the Extension must take this into consideration; for instance, by using NSObject.InvokeOnMainThread if they want to update the user interface. See the Communicating with the Host App section below for more details. By default, Extensions and their container apps can not communicate, despite being installed together. In some cases, the Container app is essentially an empty "shipping" container whose purpose is served once the Extension is installed. 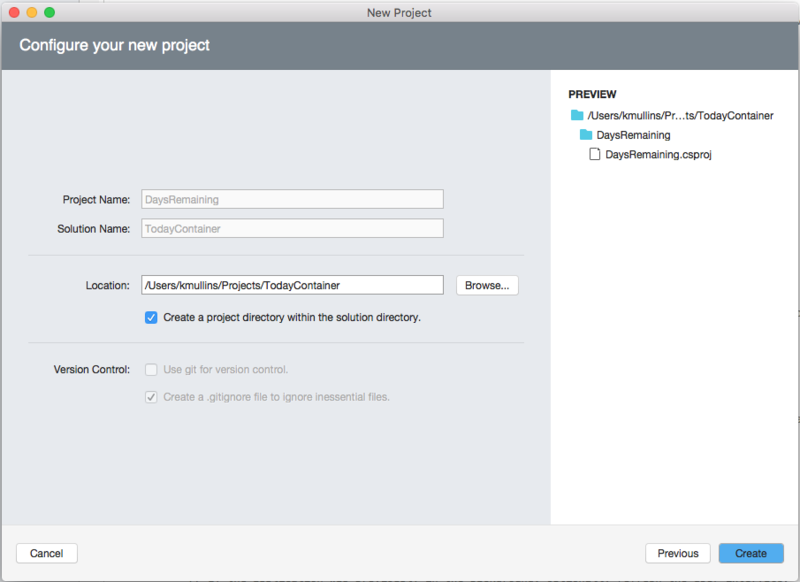 However, if circumstances dictate, the Container app and the Extension may share resources from a common area. Additionally, a Today Extension may request its Container app to open a URL. This behavior is shown in the Evolve Countdown Widget. 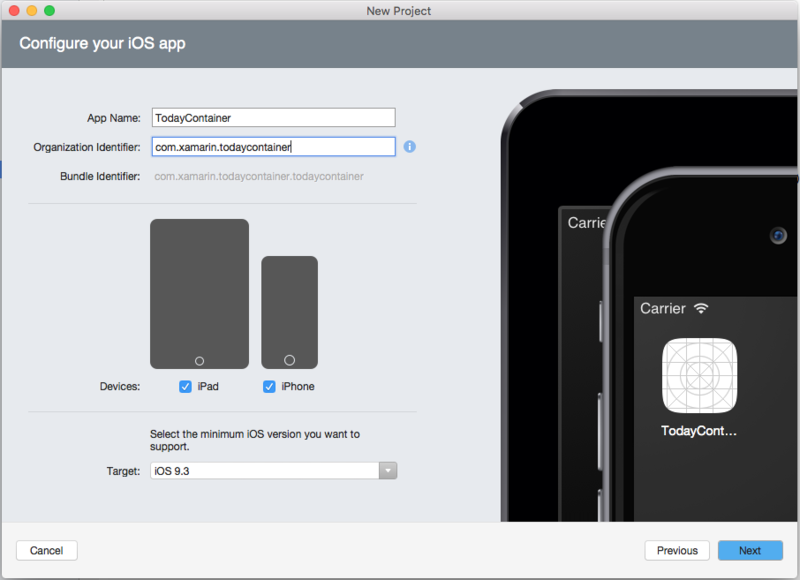 Extensions (and their Container apps) must be 64-bit binaries and built using the Xamarin.iOS Unified APIs. 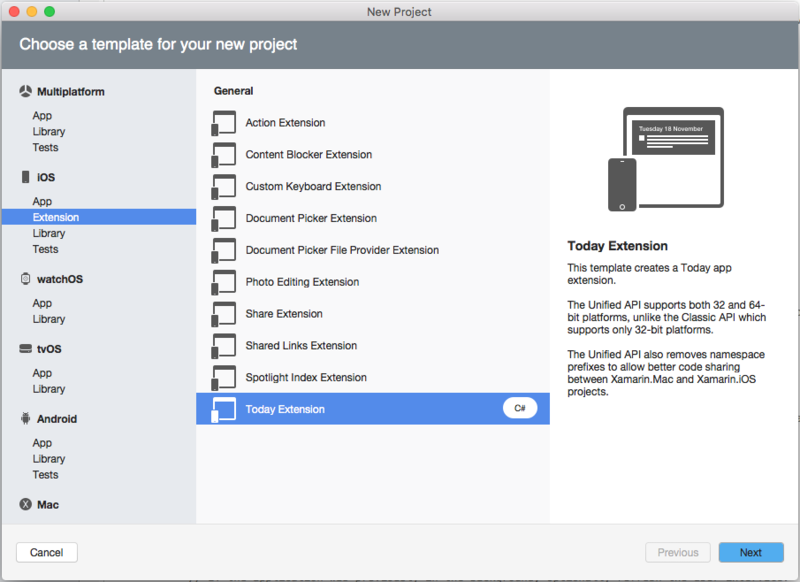 When developing an Extension, your solutions will contain at least two projects: the container app and one project for each Extension the container provides. It must maintain a reference to the Extension project. It must be a complete app (must be able to launch and run successfully) even if it does nothing more than provide a way to install an Extension. It must have a Bundle Identifier that is the basis for the Bundle Identifier of the Extension project (see the section below for more details). 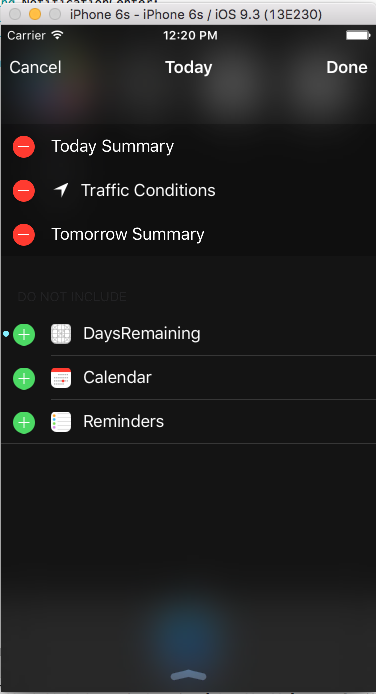 It must define the key NSExtensionPointIdentifier, with an appropriate value (such as com.apple.widget-extension for a Today Notification Center widget), in its Info.plist file. Use the NSExtensionMainStoryboard key to specify the name of the Storyboard that presents the main UI for the Extension (minus .storyboard). For example, Main for the Main.storyboard file. Specific types of Extensions may have additional requirements. 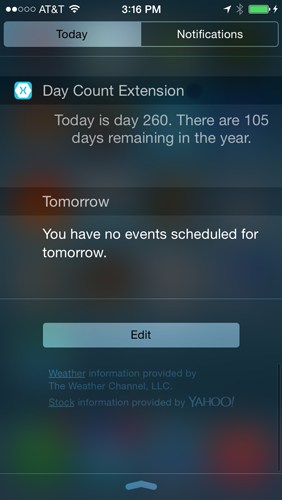 For instance, a Today or Notification Center Extension’s principal class must implement INCWidgetProviding. 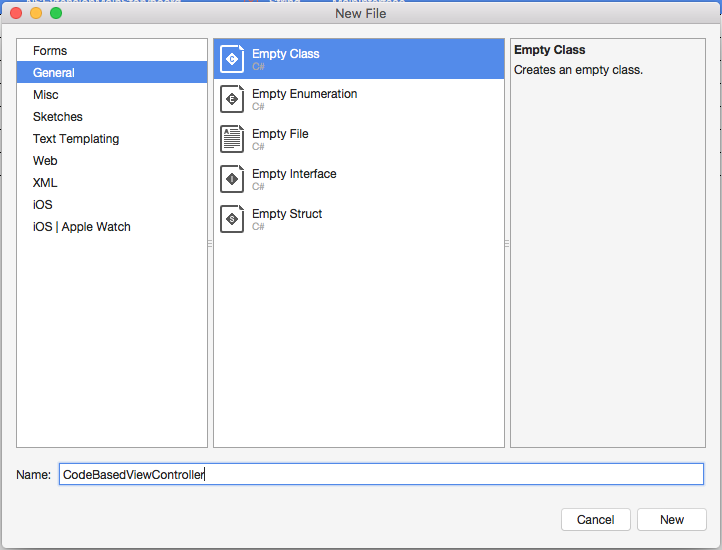 If you start your project using one the Extensions templates provided by Visual Studio for Mac, most (if not all) these requirements will be provided and met for you automatically by the template. 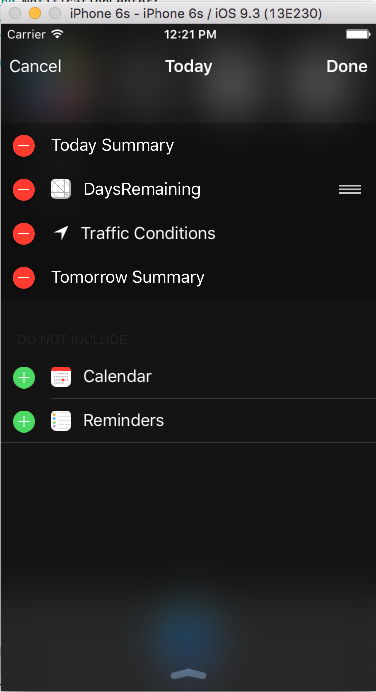 Next, you will need to design the interface for your Today widget. This can either be done using a Storyboard or by creating the UI in code. Both methods will be covered below in detail. Note that the [Register("CodeBasedViewController")] matches the value that you specified for the NSExtensionPrincipalClass above. If using the code based User Interface method, replace the // Insert code to power extension here... comment with the new code from above. After calling the base implementation (and inserting a Label for the code based version), this code does a simple calculation to get the day of the year and how many days are remaining. Then it displays the message in the Label (TodayMessage) that you created in the UI design. Note how similar this process is to the normal process of writing an app. An Extension's UIViewController has the same lifecycle as a View Controller in an app, except Extensions do not have background modes and are not suspended when the user is finished using them. Instead, Extensions are repeatedly initialized and de-allocated as required. The example Today Extension you created above does not communicate with its host app (the Today screen). 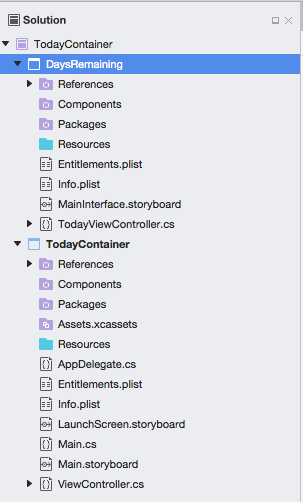 If it did, it would use the ExtensionContext property of the TodayViewController or CodeBasedViewController classes. For Extensions that will receive data from their host apps, the data is in the form of an array of NSExtensionItem objects stored in the InputItems property of the ExtensionContext of the Extension's UIViewController. Other Extension, such as Photo Editing extensions, may distinguish between the user completing or cancelling usage. This will be signaled back to the host app via the CompleteRequest and CancelRequest methods of ExtensionContext property. 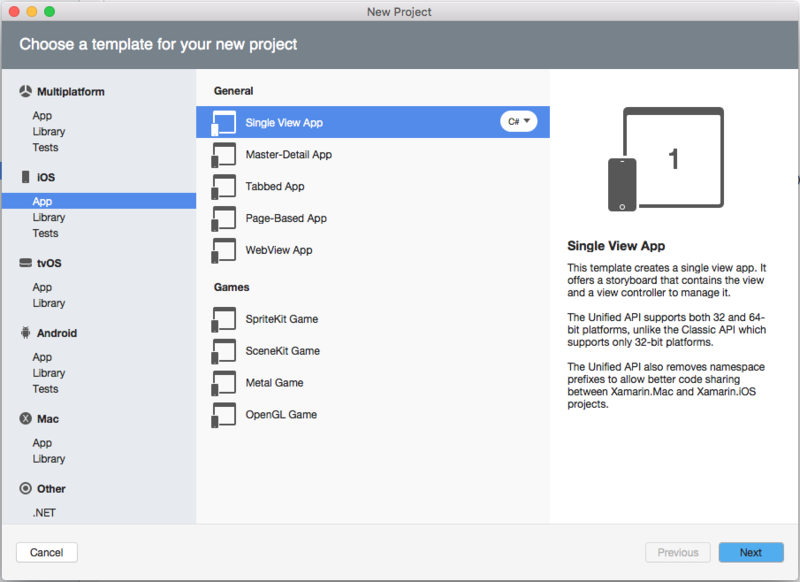 For more information, please see Apple's App Extension Programming Guide. For more information, please see the App Groups section of our Working with Capabilities documentation. When working with extensions, use a Uniform Type Identifier (UTI) to create and manipulate data that is exchanged between the app, other apps and/or services. Extensions have significantly less memory available to them than apps do. They are expected to perform rapidly and with minimal intrusion to the user and the app they are hosted in. However, an Extension should also provide a distinctive, useful function to the consuming app with a branded UI that allow the user to identify the Extension's developer or Container app they belong to. Given these tight requirement, you should only deploy Extensions that have been thoroughly tested and optimized for performance and memory consumption. This document has covered Extensions, what they are, the type of Extension Points and the known limitations imposed on an Extension by iOS. It discussed creating, distributing, installing and running Extensions and the Extension lifecycle. It provided a walkthrough of creating a simple Today widget showing two ways to create the widget's UI using either Storyboards or code. 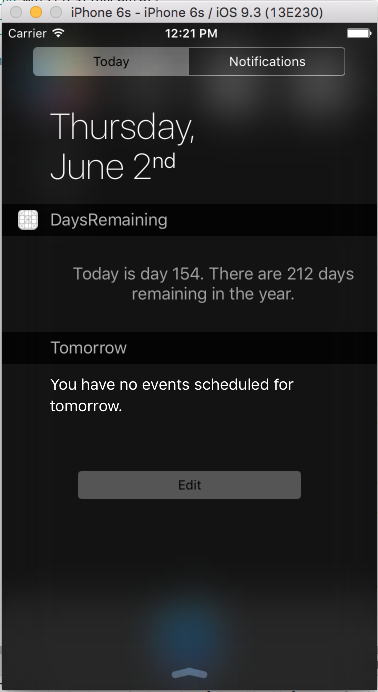 It showed how to test an extension in the iOS Simulator. Finally, it briefly discussed communicating with the Host App and a few precautions and considerations that should be taken when developing an extension.